If you are certain that a craftsman (or -woman) was a poet not just an illustrator (and most great names in art were poets), then the chances are that when they depict an animal it will be a self-representation, the artist as animal. 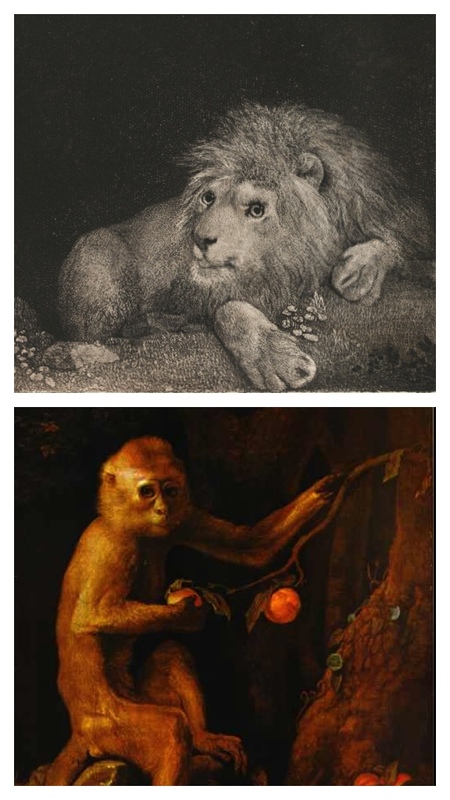 In a print like this one (left) in which Stubbs' lion is the only element you can guarantee it in advance. The trick is to prove it and perhaps rid yourself of that stubborn idea about Stubbs' art, that it is scientific and objective. 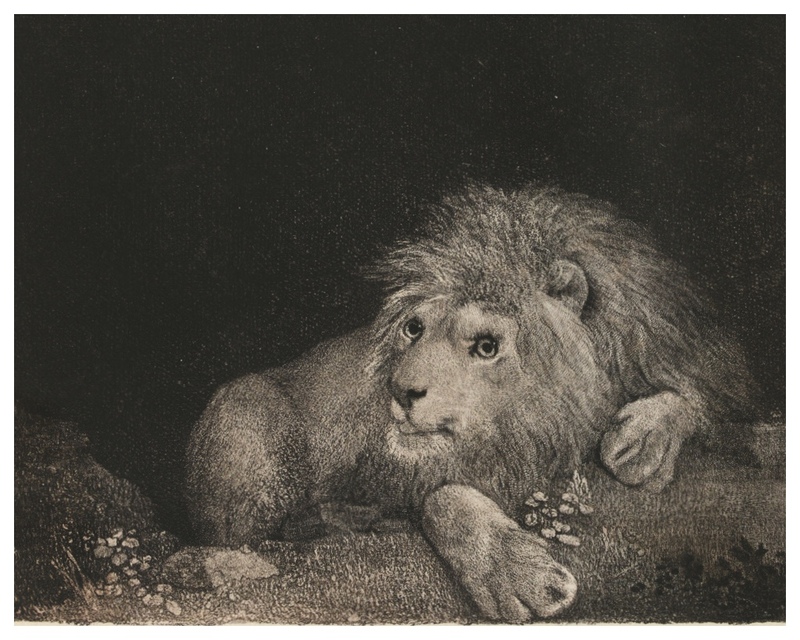 Stubbs, A Lion (1788) Soft-ground etching with roulette work on paper. British Museum, London. 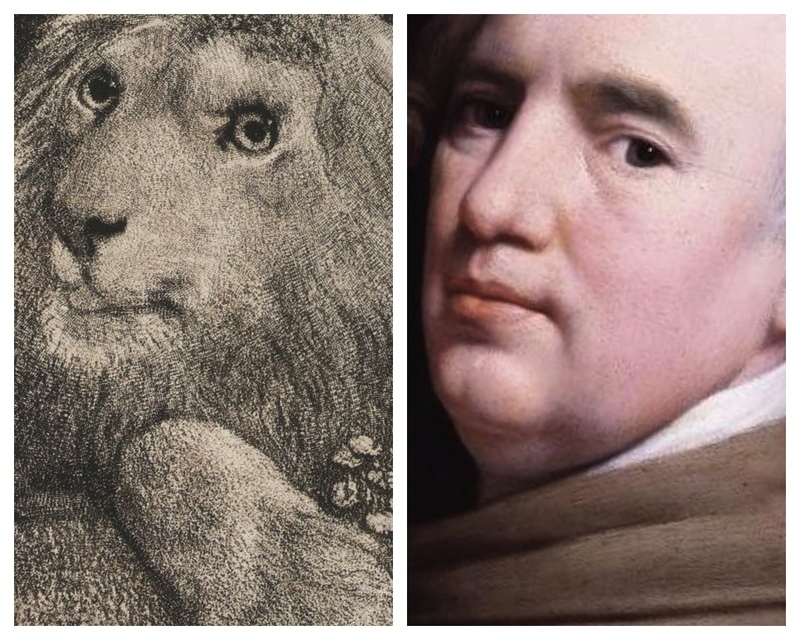 With that now in mind, Stubbs' lion resembles a teddy bear with glass eyes wide open, large pupils and a ridiculously small mouth for the king of the jungle. Lion paws are indeed large but when you compare the size of these, and of its head, to the minuscular view of its rear-end, these paws look enormous. We seem to be looking at the scene close-up, through a yet-to-be-invented wide-angle lens. Whatever the method of construction, though, the paws and head are out-of-scale. Why? The head (intellect), eye (vision) and the arm or hand (craft) are a visual poet's three most important self-referential symbols. That's why all three here - head, pupil and paw - are large. 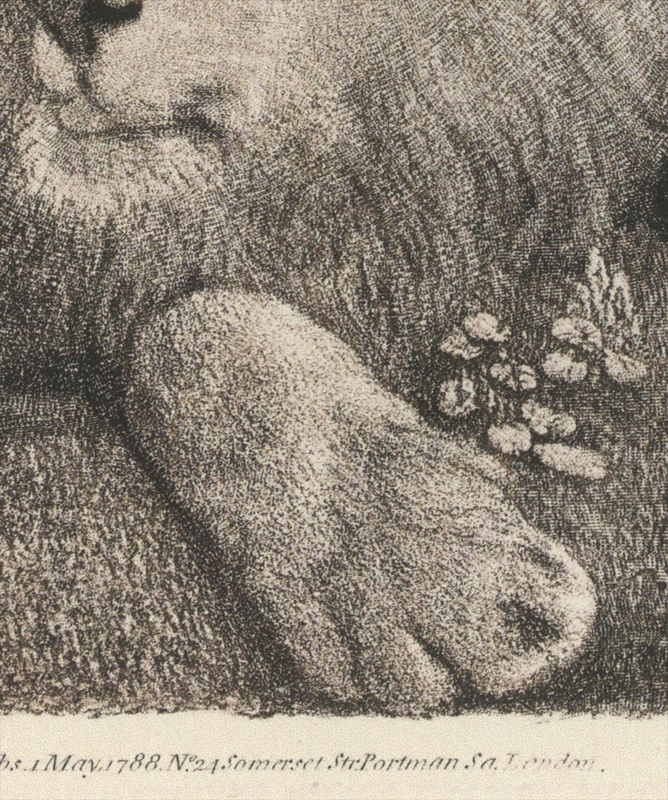 Besides the paw, soft and furry like a brush, also rests on the edge of the image where artists' hands or paintbrushes often rest in self-portraits. Albrecht Dürer made similar use of fur in his 1500 Self-portrait and my interpretation of Stubbs' later painting of a Green Monkey (bottom) is in line with this one: an anthropomorphic creature looking out of the image like an artist at his easel (read more). 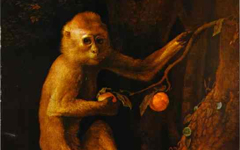 Bottom: Detail of Stubbs' Green Monkey (1798) Oil on canvas. Walker Art Gallery, Liverpool. 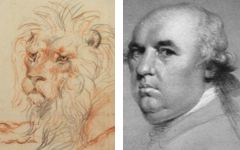 If you now compare the lion's face to the artist's in a 1781 self-portrait, the evidence becomes quite compelling. The lion's nose resembles the artist's in profile. And the inexplicably large pupils are Stubbs' too though his dark irises make that difficult to see. The seemingly tame lion even has a descending shadow by the side of his mouth almost the same shape as the one in the self-portrait. R: Detail of Stubbs' Self-portrait, rotated (1781) Enamel on a Wedgewood plaque. National Portrait Gallery, London. That paw, the real focus of the image, contains even more meaning. Lit overhead by a light that has little impact on the lion's head (which should be in partial shade), the paw has a distinct shadow to the left of it. A shadow with a straight contour, parallel to an arm, hand or finger is a common clue that the body part is composed not within the scene itself but outside above the paper or the canvas like the artist's real hand. The deceptive shadow is not on grass but the image itself. You can see this "unknown" method in works by Raphael, Rembrandt, Tiepolo, Ingres and others. 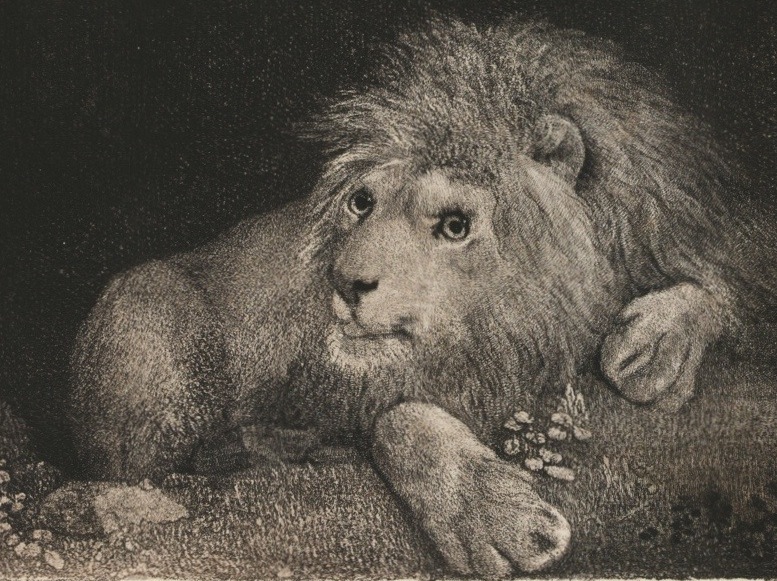 The lion as Stubbs' inner image unites exterior dualities as both subject and object, artist and model. It represents the courageous, wild nature of his creative spirit and, through its fur's link to a paintbrush, his craft as well. Original Publication Date on EPPH: 29 Sep 2013. © Simon Abrahams. Articles on this site are the copyright of Simon Abrahams. To use copyrighted material in print or other media for purposes beyond 'fair use', you must obtain permission from the copyright owner. Websites may link to this page without permission (please do) but may not reproduce the material on their own site without crediting Simon Abrahams and EPPH.